Can I leave the calendar and edit my record directly? Yes! Click on an event and in most calendars, you'll see a button to view the event in it's native app: Google or Basecamp, for example. For Salesforce and FileMaker sources you'll want to create a custom action that takes the user right to the page you'd like them to edit on. This is easily done by adding a custom action to your source setup. Custom actions can do all sorts of things but navigating to the record in Salesforce is one of the most common actions. Setting up this custom action creates a button your users can click on to go to that item's page. Note that currently, this is not an option in DayBack for Salesforce 1: navigating to the records own Salesforce page only works in desktop browser versions of Salesforce. Click on "Administrator Settings" at the bottom of the Settings tab in DayBack's left-hand sidebar. Scroll down past "Field Mapping" until you get to " Custom Actions"
Click "Add New Custom Action" and give your action a name: if your object is a task then the action name might be "Go to task". This action name will become the name of your button. Can I go right to the item in Salesforce without seeing the calendar's popover? Absolutely. You'll create the same kind of action as the one described above but will create an event action instead. This way when you click on an event, DayBack will run that "navigate" action instead of opening the calendar popover. Event actions are triggered when an item in the calendar is clicked on, saved, or deleted; these actions have the option to override the default click, save, or delete behavior. Custom actions appear as buttons in the item's popover drawer and are triggered when a user clicks on them. Scroll down past "Field Mapping" until you get to " Event Actions"
Click "Add New Event Action"
The first attribute of the action is what should trigger it: set this to "On Event Click". Set "Open in new window" to "no" and set "Prevent default action" to "yes"
Event actions that navigate on event click are great when the record already exists in Salesforce, but if you try to create a new item from within the calendar in a source with this kind of action set up you'll get a Salesforce error since the event you're trying to navigate to doesn't exist yet. So this action is best for read-only sources. 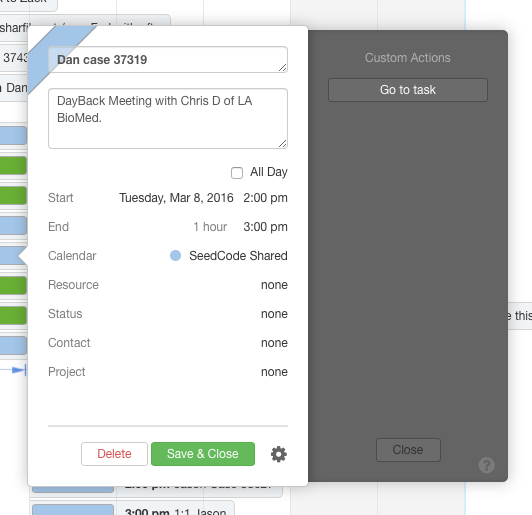 For others, where you sometimes want to create items from within the calendar as well, consider adding the navigation option as a custom action instead--so users can create the new item in DayBack's calendar popover and then navigate to it. Can I Click a Button in the Calendar to See the Event in My FileMaker File? This is one of the things we designed custom actions to do. Simple custom actions like this just open a URL, so a custom action could be added that jumps over to the event's contact or project in FMP, FMGo or even in WebDirect. Notes on how to make actions and how to include fields from an event in those action URLs can be found here: custom actions.